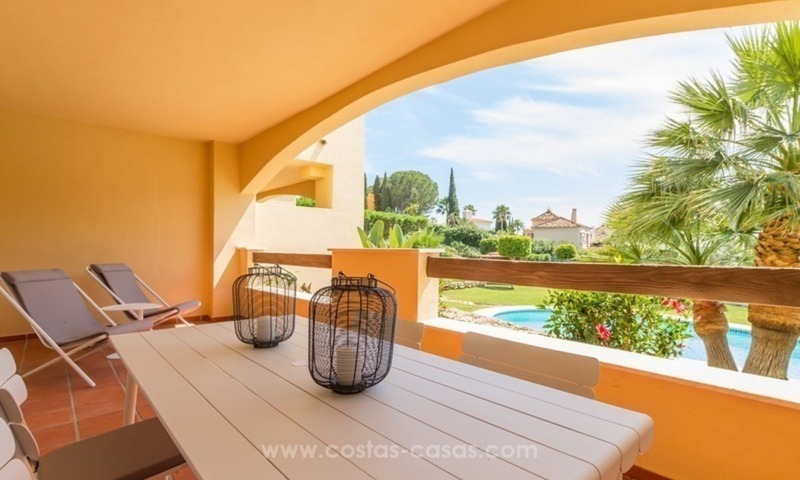 Spacious main covered terrace of 55 m2 adjacent to the communal garden which extends up to the border of the complex. (+/- 130 m2). The covered terrace could be closed with glass curtains that can be easily opened or closed as desired. This would extend considerably your living space so you can enjoy the outside life also in winter evenings or in the few days you do not have good weather. 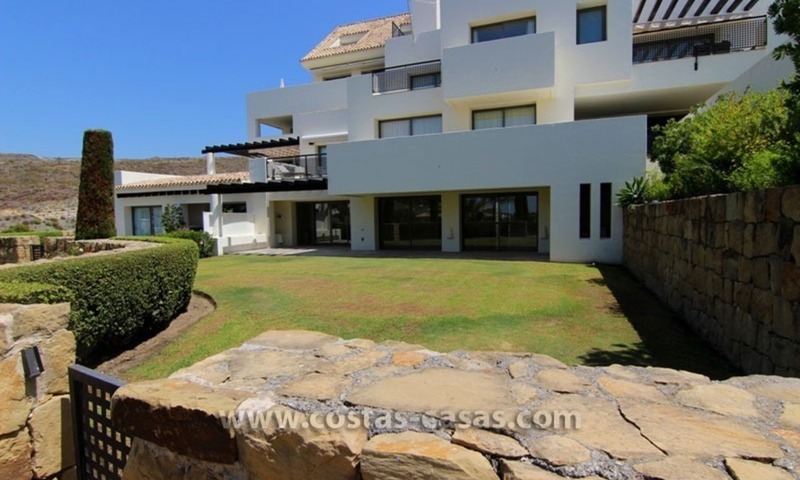 Unobstructed view to the garden, to the golf course and to the coast up to the Strait of Gibraltar and Africa. Fully fitted and equipped kitchen with Bosch appliances, granite worktop, American bar and laundry room. 2 bedrooms, 2 bathrooms of which 1 is en- suite with a hydro massage bath. You have a direct exit to the terrace from one of the bedrooms. The bedroom in the back has also a lovely view to the valley and the La Concha mountain. The gated and secure resort built in an Andalusian style is located on an elevated position and is looking out over the golf course towards the sea. The resort is located in a golf area just a strone´s throw away from it and the golf area has 24h.security with CCTV. There are communal gardens, 2 swimming pools with a pool house and a gym. The nearest supermarket is at short walking distance. 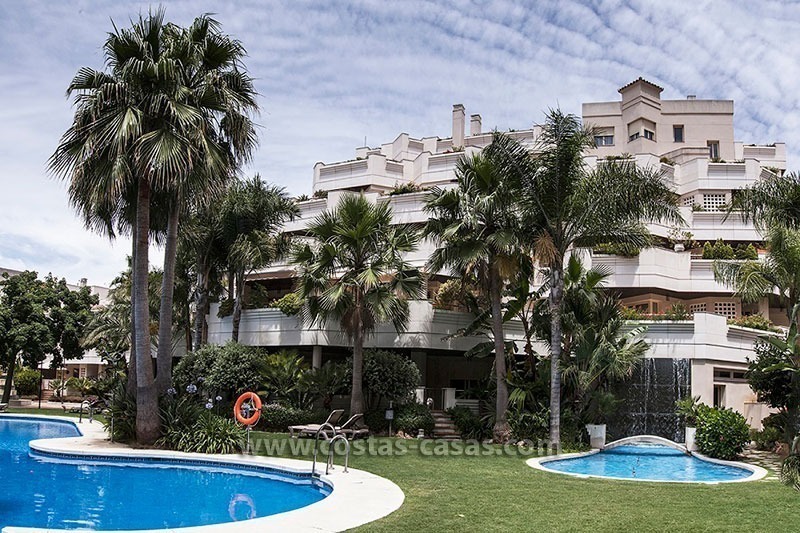 The resort is located only a few minutes drive away to the picturesque mountain village of Benahavis, the beach, the beach promenade and the centre of San Pedro – Marbella with all amenities. Puerto Banus - Marbella is around 10 minutes drive. SOLD. BUT OTHER APARTMENTS AVAILABLE IN THIS COMPLEX.